15 youths asked their own questions to Gov. Kate Brown, Rep. Knute Buehler and Patrick Starnes. Childhood homelessness, the foster care system and mental health in schools: Yes, candidates, this will be on the test. 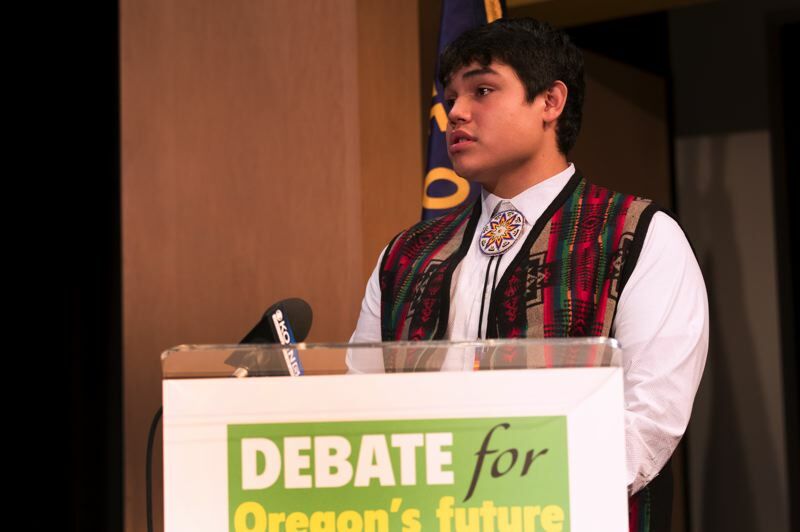 Fifteen youths from across the state pressed for hard truths from three contenders for governor during the Debate for Oregon's Future, sponsored by the Pamplin Media Group, KOIN 6 News and Children First for Oregon. You can watch the full debate here. Democratic candidate Gov. 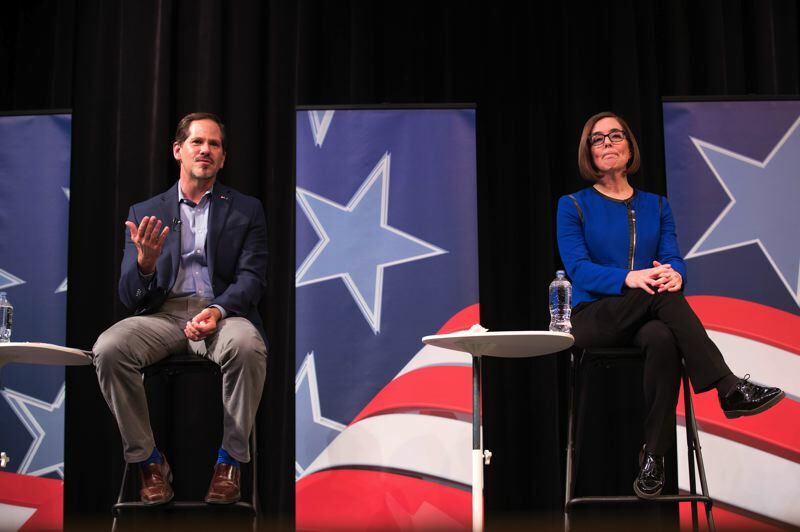 Kate Brown, Republican candidate Rep. Knute Buehler and Independent Party of Oregon candidate Patrick Starnes politely duked it out in front of a television, live and online audience for an hour at Roosevelt High School Tuesday evening, Oct. 2. But no matter who wins — you know these kids had a blast. "I was really impressed by both of their answers. 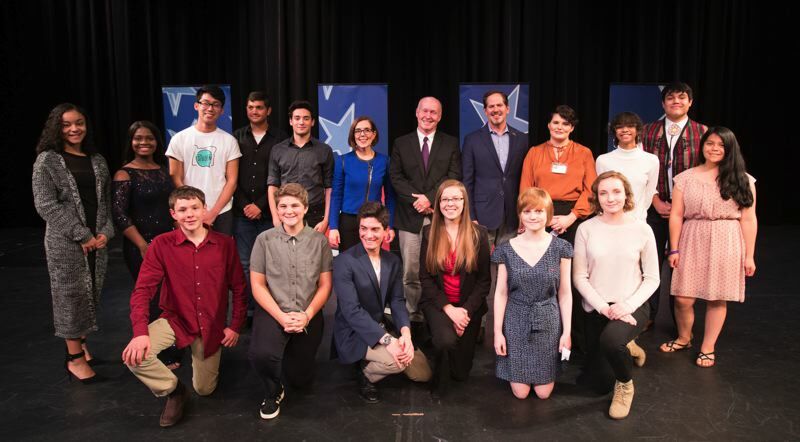 I can tell that they both care about climate change enough," said Jeremy Clark, a freshman at Cleveland High School in Portland who asked the first question of the night to Buehler and Brown. Clark, who has business cards describing himself as a climate advocate, got a chance after the debate to lobby the Republican candidate about implementing a cap-and-trade program. Clark said Buehler prefers the idea of a carbon tax. The event was moderated by Portland Tribune education reporter Shasta Kearns Moore and KOIN News 6 anchor Jeff Gianola, who gave both candidates three tries to directly answer a question about LGBTQ suicide posed by Rose Lawrence. Gianola asked Lawrence if they had answered her question, and twice the sophomore at the School of Science and Technology in Beaverton answered no. Twitter commentators mounted an immediate campaign to draft the student for a run for governor. "Children are more blunt, and they will tell it like it is. And that's just what I did," Lawrence said afterward. "The issues really matter and I want to speak my mind, and I think that's the only way to get things done." The debate had special significance for Olivia Cooper, a senior at Crook County High School in Prineville who will blow out the candles on her 18th birthday cake before the midterm elections. "I want to know their true, honest response — not their political response," said Cooper, who is currently president of her school and plans to study law. "I am going to get to make up my mind." Dazon Sigo made the three-and-a-half-hour drive from the Umatilla Reservation near Pendleton to ask his question. "I have to take into account what's going on, because it's going to affect me one day and it is affecting me," he explained. Sigo has attended Pendleton High School. He is now enrolled at the public charter Nixyaawii Community School. Sigo doesn't want much, just more attention to his school, and others like it, from the next governor. "Some schools have huge libraries. My school has a little room with a few shelves," Sigo said. "A bigger budget would be great." Sal Najjar, a 16-year-old who lives in Tigard and serves as president at Mountainside High, said recent school shootings spurred his political involvement. "These things have happened under adults' watch, and it finally came to the point where us students said: Enough."